Before I met Luke, all I knew about hemophilia was what I remembered from a Russian history class in college. The Russian royal family’s son suffered terrible bleeds, from a rare disease that apparently plagued the royal families of Europe, and his mother, the Empress Alexandra, came under the spell of plotting monk, Rasputin, who may have used hypnotism to help control some of the child’s symptoms. Once Rasputin had the Empress’ confidence, troubles began, eventually leading to the abdication and death of the entire royal family. It was like a fairytale, except with a very bad ending for all. Back in New York weeks later, I kept thinking about that sick, forgotten child. I spoke with a former client, Melissa Penn, whom I knew was raising a child with this issue. She immediately agreed that the child needed help, and proceeded to introduce me to some pretty wonderful people in the hemophilia support community. First was Laurie Kelley, founder of LA Kelley Communications, an organization that provides education and support to individuals and families affected by hemophilia, around the world. Laurie immediately put the word out to the community, and before long, a wonderful family, the Luckeys, who had experience with hemophilia, came forward to adopt Luke! While they paper chased their dossier, Laurie and Melissa arranged for a colleague within China, DeLon Kong, to provide and administer factor to Luke to stabilize his condition, and my team in China arranged for permission to provide the services. It was a small miracle. I had no idea, prior to this, that hemophilia, though not curable, could be controlled and treated with medication. This was enlightening. The experience of seeing that forgotten, overlooked child, who was suffering so needlessly, transform into a health vibrant, active boy, was such an inspiration. I started searching the CCCWA’s shared list to see if there were other boys listed, but it was very rare that an orphanage made such a child available. During my trips to visit orphanages, I began to look for the children. In May of 2014, I found a little four year old boy living in an orphanage that had partnered with the agency I was working for at that time. Again the staff looked grim when they delivered the diagnosis. When I told them I thought we could find a family for him, they looked incredulous. But, with the help of my friends in the hemophilia community, and a wonderful article in Laurie Kelley’s Parent Empowerment Newsletter, that featured international adoption as an option for children with hemophilia, a family soon came forward, wanting to adopt. Other families began expressing interest, which was a very hopeful sign. Melissa Penn, Shari Luckey, Laurie Kelley and I began having conversations that included ways to advocate for the children we could find. We formed a loose coalition, with an online group. 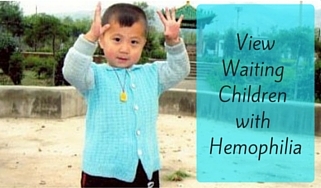 We were soon joined by Kelly Branham Cartwright, the parent of a son from China who has hemophilia. Kelly began a Facebook group, Hemophilia Adoption, to raise awareness, and to provide first hand information to prospective parents interested in learning more about what life was like for a family raising a child with hemophilia. In the group, we have been able to share information about any children we become aware of who are available for adoption, and have hemophilia. As families commit to adopting one of the children, they are encouraged to join us, as parent advocates, and to help us to educate, empower and support families undertaking the adoption of a child, usually a boy past infancy, who has hemophilia. So we have formed a human chain of support to help adoptive families and children affected by hemophilia. It is very empowering, for example, to watch the video made by the Penn’s teenage son, Zak, as he talks about what his own life is like, and walks us through all the misconceptions about hemophilia, to the facts, and shows us how he cares for his own needs. By forming a community of parents, medical professions, and adoption professionals, we are providing families with comprehensive education and support to help them to decide to adopt, and when they do, to support them in raising a child who has hemophilia. Adopting a child who has a bleeding disorder truly means giving a child the opportunity to have a normal life, with a typical life span. We are told that the average life expectance for a child who has a bleeding disorder and inadequate or no medication is 20-25. With medication, affected children can participate in most activities and can expect a normal life expectancy. 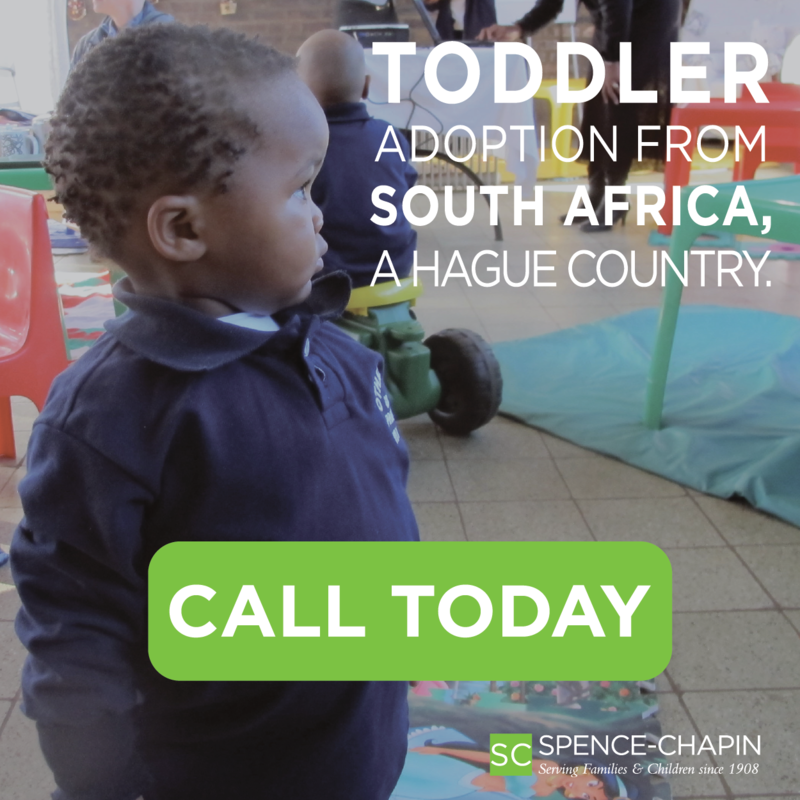 An adoption of this type means that the child will finally have a family of his own, but it is also lifesaving. Saving a life is not a good sole reason to adopt. Parenting an older child, especially one with medical needs can be challenging. But for these children, that element of a life saved is also present, and is powerfully satisfying for all of us who advocate for the children. The joy of matching a child with a family is infectious, and new families have an ever growing cheering section to encourage them! Most of the children we now identify are past infancy. When they were younger, efforts were not often made to complete the extensive paperwork needed to make them available to be adopted. If occasionally, a child was listed, his file might sit on the list for years, and he would not be chosen, even as children with other serious medical conditions would be adopted. Not many families knew a lot about hemophilia, and shied away from the unknown. Many of the children have suffered, terribly, needlessly. On one ten year old’s file, the medical advice I read in disbelief was “avoid collision”. It is our hope that children will be identified at a younger age in the future, so that they can find families sooner, and suffer less of the effects that long term, painful, untreated bleeds can bring. We hope that girls with bleeding disorders can be identified earlier as well. It does seem that we are seeing a number of younger children being adopted in the past six months or so, and that is an encouraging sign. Working together, we have been able to identify and match nine boys with hemophilia in the past year, ages 3-13. The average age has been 10. This has been the result of a focused and concentrated effort, driven by parents and professionals who are passionate about making a difference for the children we can identify. They have waited in pain, too long. All of us are very happy to share information with anyone interested in adopting one of the children. More and more boys are being listed by China all of th time. Every one of them is precious to us! Each deserves the opportunity to be loved in a family, and to live without pain and suffering. With education, comes understanding. We have a wonderful group available to provide excellent information to any families wanting to consider adopting a child with a bleeding disorder! And what of Luke Luckey, that little sick, skinny boy who touched my heart? Now 15, he is a healthy, outgoing young man, beloved son, with movie star good looks, who goes rock climbing in his spare time!!! 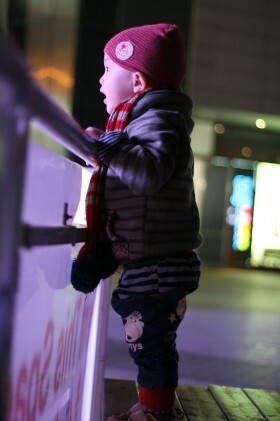 Read Luke's Family Adoption Story here!